I have made good on a few of my New Year's promises to myself. Accept challenges with grace and determination. Step outside my comfort zone more often. Take better care of me - my body, my soul, my spirit. I have also been gluten-free for 2 months. 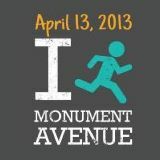 My dad challenged me to run the Monument Avenue 10K with him. I accepted. With determination (but a lot of some internal kicking and screaming). I am stepping outside my comfort zone here people. 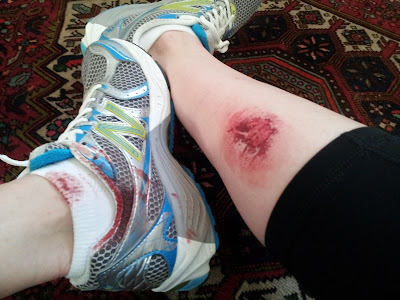 I have not been a runner in 20 years. Three kids and lots of college/post-college beer makes 20 pounds too. It's an effort to take better care of me. Yes, my body, but I also find running helps me clear my head. Find some peace. And quality time with myself, which is essential to me to be a good wife, mother, daughter, sister, person. I am sore. So. Very. Sore. Knowing I have to run sometime during the day stresses me out. 20 years and hoisting three children on my hip for 9 years has rendered my body slightly misaligned. I have two different kinds of orthotics in my shoes. One to supplement the 1/4 inch that's missing from my left leg. Another to reinforce arch support in my other shoe. Further proof my alignment is out of whack? I am proud of what I'm teaching my daughter. I love running with her (incidentally, she can go out and run 3.5 miles no problem and still do it faster than me, and I love that about her). It gets hot in Richmond in the summer. Really, really hot. And I don't do well in the heat. Or the cold for that matter. I'm kind of a baby that way. But, I will persevere. I made a promise to my dad, my daughter, and myself. And, I owe it to all of us to see this through. Good work Jennifer (well, except for the kicking yourself...) You are inspiring :) Thanks for sharing this! Way to go! I am not a runner by any means, but have thought about maybe trying a 5K!